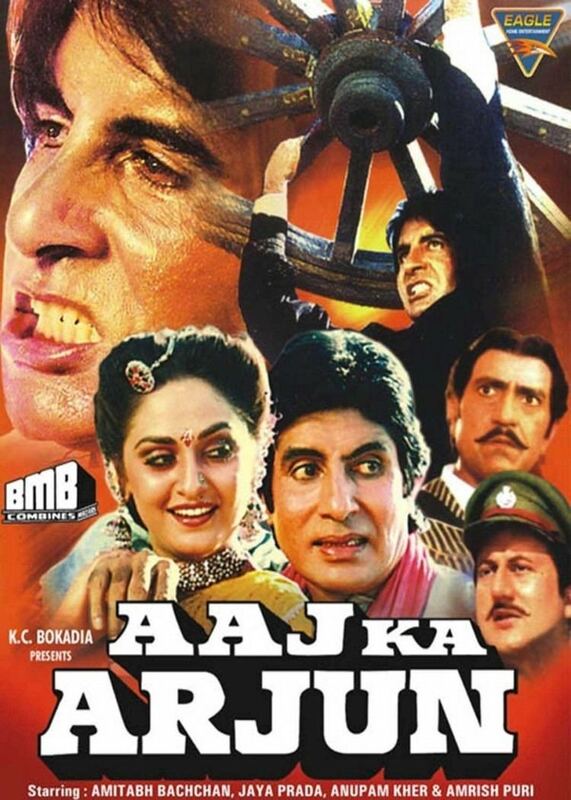 Aaj Ka Arjun (Hindi: आज का अर्जुन) is a 1990 Hindi crime drama film, directed and produced by K.C. Bokadia and starring Amitabh Bachchan and Jaya Prada. The film premiered on 10 August 1990 in Mumbai and was filmed in Rajasthan. The film became a box office hit. It is a remake of 1988 Tamil film En Thangachi Padichava starring Prabhu Ganesan and Rupini. Thakur Bhupendra Singh (Amrish Puri) and his son Ajit (Rishabh Shukla) are landlords, presiding oppressively over a small Indian community. Ajit gets Laxmi (Raadhika) pregnant and casts her aside. Her brother Bheema (Amitabh Bachchan) goes to plead with them to accept Laxmi as their daughter-in-law and they reject his pleas and have him thrown out. Bheema tries to avenge this humiliation, only to have his sister killed. Bheema is imprisoned, and after his sentence is over he returns to his community, only to be told that he can no longer reside there, as the entire community is terrified of the Thakur and his men. Bheema then decides to move out of town. Some villagers and a police officer (Anupam Kher) persuade Bheema to return, and he agrees. On his return, Bheema's nephew Kanhaiya (Baby Guddu) is abducted by Thakur and his men, and he will only be returned after Bheema obtains signatures/thumb prints from everyone in the community, thereby turning over their properties to Thakur's name. Will Bheema compromise the safety of his nephew, and will he able to persuade the community to bow down to Thakur's demands? Music for the film was composed by Bappi Lahiri, one of the leading music directors of the time. The film has a memorable number "Gori Hai Kalaiyaan, Tu Laade Mujhe Hari Hari Choodiyaan" with voices lent by Shabbir Kumar and Lata Mangeshkar, which earned great popularity that year. During those days, when cable television and Dish TV facilities were not as popular in India as they are today, this song was often telecast in some programmes of Doordarshan as a trendy track of that period. Picturised on Amitabh Bachchan and Jaya Prada, the song charmed the listeners, and today it is considered as one of the evergreen songs of the 90s.